Do you frequently see red when you brush and/or floss your teeth? We’re not talking about getting angry — except at the blood you may see as a result of your bleeding gums in Jacksonville. Many people experience this symptom, and, all too often, they ignore it. Keep reading to learn about the #1 cause of bleeding gums and why you should definitely pay attention when it happens to you. It could mean gum disease! Gum disease: This is the most common reason the gums bleed. You may notice blood in the sink after you brush your teeth, or it may show up on the dental floss. In the most severe cases, the gums may even bleed when you are eating something crunchy. Aggressive tooth brushing: It may feel like you are getting an extra-thorough clean when you brush your teeth hard from side to side, but you are actually just wearing away at the sensitive gum tissue. Hormonal changes: Women may temporarily experience bleeding gums during pregnancy or menopause due to changes in hormones which affect the gum tissue. 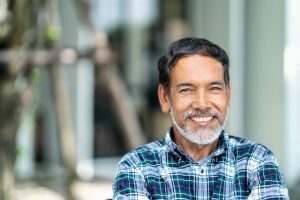 Ill-fitting dentures: If you have a denture that is loose or uncomfortable, it may slip and slide around and cause oral sores that can bleed. Injury: The gums may bleed due to a scratch caused by nail biting, pen chewing, or from an injury sustained during sports. For bleeding gums caused by gum disease, seeking professional treatment is of the utmost importance. This condition has been linked to a number of conditions affecting oral and overall health, including diabetes, certain heart conditions, respiratory illnesses, and even memory loss. When untreated, gum disease eventually results in tooth loss — which also takes a toll on everything from your nutritious diet to your self-confidence. The appropriate treatment for gum disease in Jacksonville depends on the extent of the infection. In the beginning stages, gum disease may be reversible with improved oral hygiene practices and a few extra visits to your dentist’s office. Moderate stages of gum disease can be treated with scaling and root planing, which removes bacteria from above and below the gum line and smooths the teeth’s roots to prevent reinfection. After the disease has become advanced, you may need to see a specialist for surgical treatment. Heed the warning given by bleeding gums and see your dentist to find the appropriate solution. If gum disease is the cause, you want to get it treated sooner rather than later! The Jacksonville Dental Specialists offer exceptional dental care, including dental implants, sleep apnea treatment, and periodontal therapy, from a state-of-the-art office. If you are experiencing bleeding gums, don’t wait to find out whether or not you need gum disease treatment. You are invited to get in touch with the office by calling them at 904-323-0928 today!